It was my first New Year’s Eve in Las Vegas and I was dressed for it: black satin leggings, sparkly camisole and black jacket. I elbowed my way through hundreds of thousands of people, a surprising number of them pushing baby strollers. I made eye contact with a lot of glazed-over toddlers and avoided swaggering males with yard-long cocktails slung on lanyards over their shoulders. Lithe young girls in icepick heels and pelvis-level hems took delicate steps next to an aisle of handcarts vending party gear. Fluorescent bunny ears, $3.00. Cops in bright yellow jerseys smiled. Although more than four miles of the Las Vegas Strip had been transformed into a pedestrian mall, there wasn’t enough room for 300,000 people. They came from Korea and Bosnia and the San Fernando Valley, and most of them were there hours before the fireworks started. The streets and parking garages had closed at 4:00; after 11:00 PM, the hotels and casinos, too, shut their doors—paying clientele in, everyone else out. The Paris, where I was headed, had even erected a 12-foot chain-link fence around its lovely perimeter, giving its elitist Gallic architecture a sauve-qui-peut bunker quality. Security carefully monitored who went in and who didn’t. I was lucky. I was among those with a reservation. No one in my party had ever done New Year’s Eve on the Las Vegas Strip before. Ditto Times Square, the Champs-Elysées, Copacabana beach or Piazza del Popolo. Most of my New Year’s memories involved deserted, far-flung corners of the globe, including one remote spot in the desert near the Iraq border, where I pushed my baby stroller through the sand as the moon shone upon Palmyran ruins and the Pharaoh Owls called to one another. That year, my kid and I were in bed before midnight. In fact, as I considered my New Year’s Eves past, I realized I was often in bed when the dateline changed—partly because I had wandered far from the herd, partly because of disposition. I would have considered it this year, but the cultural imperative to celebrate throbbed in every neon bulb. “This is Vegas,” my friends insisted. From our perch slightly above the sidewalk in one of my favorite Strip restaurants, Mon Ami Gabi, we had a direct view on the throng that moved and flowed according to a pattern that was difficult to parse. The brides—Las Vegas always has brides—were easily discernable in their white gowns and tended to appear in the middle of the flow, their veils billowing, some still clutching their bouquets. On the edge near the restaurant, couples wearing glowing-horn headgear congregated (maybe they were of Viking descent). Not far away, in the direction of Bally’s, two sincere young men carrying “Free Hugs” placards scouted huggees making their way toward the Cosmopolitan. As I nibbled on my escargots and watched the crowd slow to a snail’s pace, I kept wondering why New Year’s Eve means so much to civilization that it propels us to converge in record-breaking crowds, resulting in rolling celebrations around the planet. The fact that it’s not even the true beginning of the year—an astronomical event marked by ancient civilizations at Winter Solstice before the Julian calendar took over—doesn’t seem to matter. Vegas was booked at 96% capacity. I decided that the prospect of a fresh start, clean-slate moment when we can sweep all the cobwebs away and start anew reverberates in our collective psyche with such force that nothing else matters—conflicts are put on hold, the markets take a break, commerce shuts its doors. We believe that there is a rupture in time so prodigious that it can impact personal, social and economic patterns of experience. We can stop 2011 and start 2012, and in that shift, we are collectively reborn. Hope is restored, resolve strengthens. The New Year gives us, at least momently, a feeling of power to change ourselves and our world. As the final countdown approached, the Mon Ami Gabi staff passed out noisemakers, tiaras and top hats. Diners seated away from the windows moved to the balcony, and together we joined our comrades on the Strip in watching eight minutes of fireworks. The chefs and sous-chefs, the waiters and sommeliers, the dishwashers and bartenders, crowded alongside the clientele as colorful explosions, suggestive of cosmic beatitudes, filled the Vegas sky. For those few precious moments, everyone was happy. This entry was posted in Culture and tagged 2012, baby strollers, bartenders, beatitudes, brides, bunker, bunny ears, calendar, casinos, celebrations, Champs-Elysees, change, chef, cocktails, collective psyche, conflict, Copacabana, cops, Cosmopolitan, crowd, culture, fashion, fireworks, food, hotels, hug, Iraq, Mon Ami Gabi, New Year's Eve, Palmyran ruins, Paris, patterns, Piazza del Popolo, power, resorts, security, solstice, sommeliers, Strip, tiaras, toddlers, Vegas, veils, Viking. Bookmark the permalink. 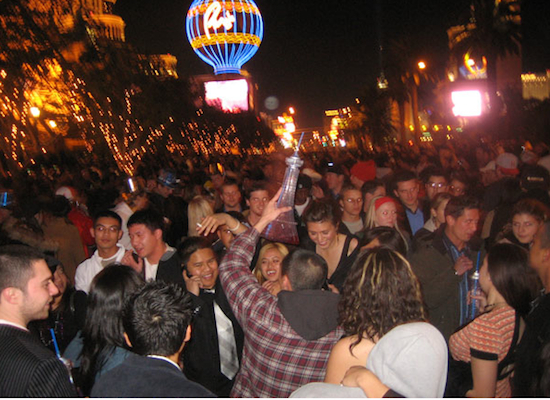 Great article and an accurate description of New Years on the strip, speaking from experience. Hate those baby strollers. Mona ami Gabi, one of my favorites! Thanks, Sandra! If anyone know Vegas, you do!!! Comme toujours, moments délicieux que de te suivre dans tes pérégrinations à travers le monde et de pouvoir lire avec délectation tes nouveaux travaux. Bonne année à vous deux, en espérant qu’un de ces jours nos chemins se recroiseront. Bravo et continue à écrire, c’est si beau à lire. Ravie de voir tes mots ici! Moi aussi, j’aimerais te voir. Pourquoi pas nous rend visite à Las Vegas? Entretemps, je vous embrasse, tous les quatre…. palatable escargot en las vegas?! Absolutely. Never underestimate the restaurants here.